In this page we will learn struts 2 and hibernate 3 integration using annotation. I will create a user form and the detail of user will be saved in Mysql database. We will create dao class that will be called from action class. We will understand integration points step by step. To integrate struts 2 with hibernate using full-hibernate-plugin find the link. Now on this page we will integrate struts 2 with hibernate without using full-hibernate-plugin. For the demo, we are creating a userdetail table which will consist id, name, email and age of a user. user.jsp is the user form in which user will fill the information. User form page will look like below in which we will fill user information. Find the success page which will appear once the user details is saved in database. The page will look like as below. 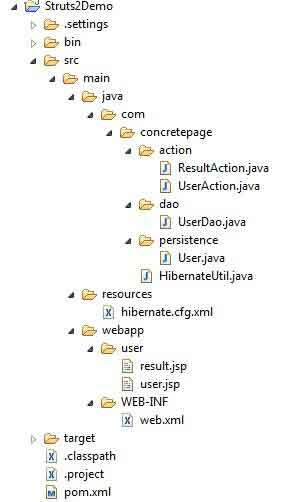 hibernate.cfg.xml has been used for MySQL database configuration. To get the hibernate session, we have created below class. UserAction class will redirect user form to be displayed. ResultAction class has properties and its setter and getter method that will take the data from user input and can provide when needed. Now find the Entity class for hibernate that maps the user details table. In UserDao class, we have written a method that will save user detail in database. Hibernate session will be obtained from HibernateUtil. Find the web.xml for struts 2 configuration. Find the maven dependency for struts 2 and hibernate 3. All the classes and XML file will look in eclipse as below. 1. Build the code with the command mvn clean package using command prompt from project root location. 2. Deploy the WAR file in tomcat (I am using tomcat 8).